Player Customization in iPlayerHD is easy and offers many options. Author’s Note – The following blog post on the subject of customizing your player may also be found as a video tutorial in the Need Help section of your iPlayerHD content manager. The video is titled, appropriately, Player Customization. You probably take special care when creating your videos. Perhaps you craft a script, maybe even with revisions. Certainly, you do some editing after the video is filmed. You put your own unique touch on the content you publish. Once you’re logged in to iPlayerHD, navigate to the Videos page. 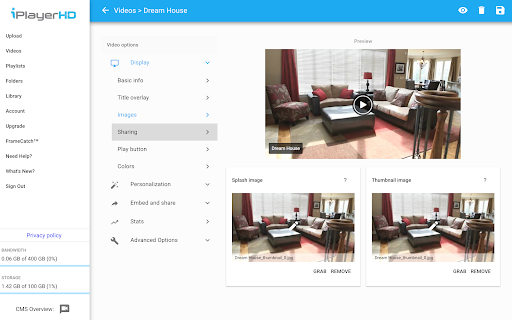 Choose the video you’d like to embed, and click on the image. This will take you to the video options page. On the video options page, under Display, choose Basic info. Here, you have the option to show an “info icon” and include a description of your video. Also under Display, choose Title overlay. 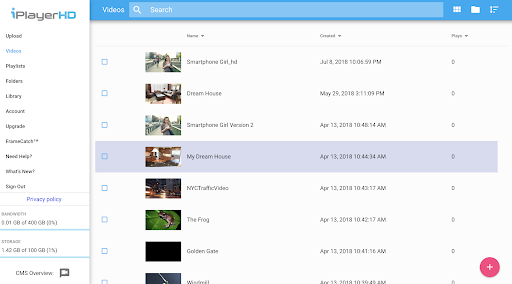 Title overlay allows you to surface the title of your video. Here, you should see three options: Auto hide, always show, and hide. 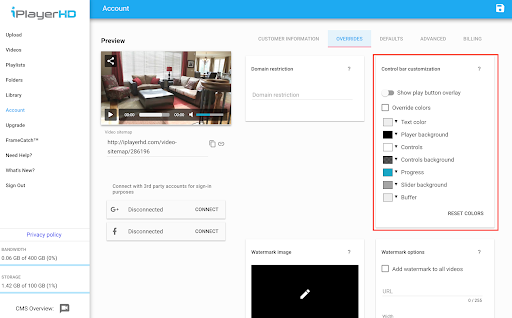 Choosing Image allows you to customize both the thumbnail and splash images. We have a separate tutorial on customizing your images, which you can find here. 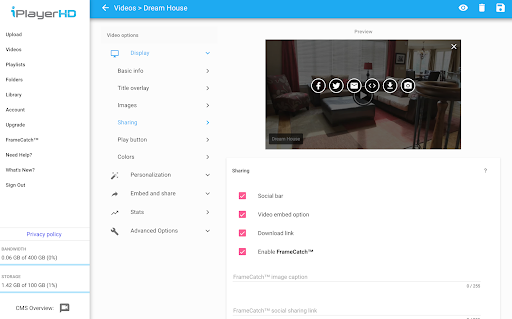 In the Sharing tab, you’ll find video player options for social sharing, embedding, or downloading. The Play button feature allows you to show the play button on your splash image, or not. The Colors tab provides an opportunity to add branding to your video player. Go ahead and play around with this feature. Have fun! You can always reset the colors to the iPlayerHD defaults and start over. 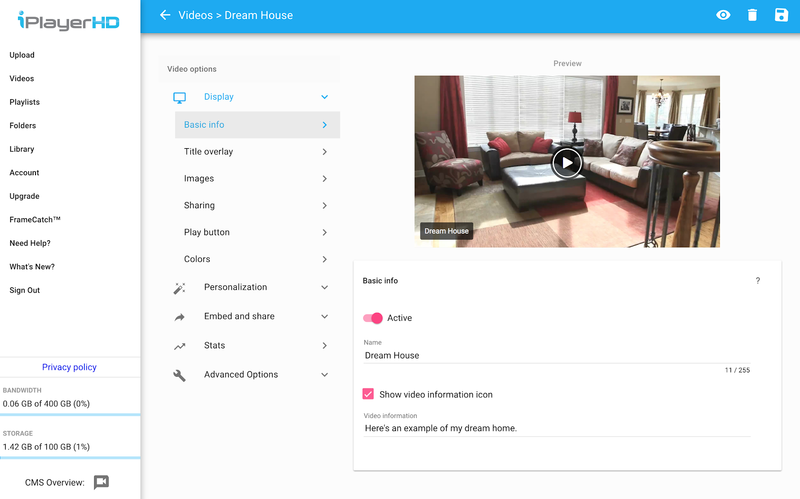 While it’s helpful to customize each video, this strategy may not always be realistic. 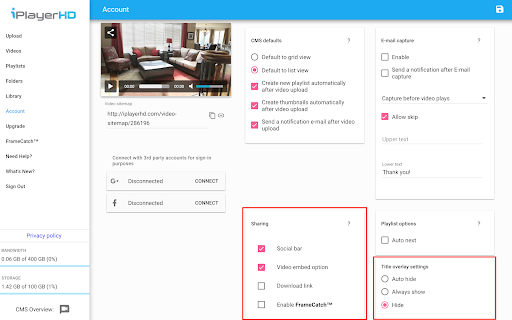 As you add more and more videos, you may want to add customized rules that apply to all of your videos automatically. Setting your default video player options is easy! On the Account page, click over to the Overrides tab. 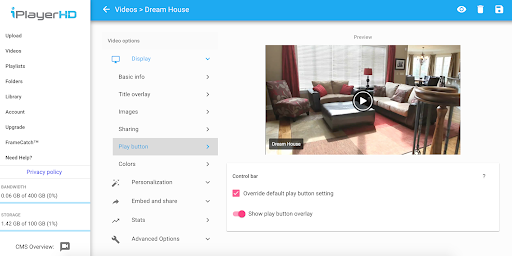 You’ll see some of the customization options we saw on the video options page, including control bar customization. If you click over to the Defaults tab, you’ll see additional options, like social sharing and title overlay settings. If you run into any trouble, please let us know! Reach out to the iPlayerHD support team at any time by emailing support@iplayerhd.com.